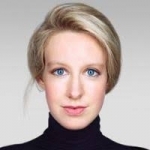 The 34 year old stunning Stanford dropout, Elizabeth Holmes once worth $9 billion personally, has been scamming Wall Street for 15 years with fairy tale technology that never worked even once. She believed her own hype for so long, the SEC has banned her from being part of any public company for a decade. She is the poster child for the scandal-ridden tech industry. Thousands of deserving business startups have been wiped out because she, and others like her, bilked investors out of hundreds of billions of dollars. When you hear her voice, it will tell you everything you need to know. Oh, she isn’t going to jail, because she is a major Clinton Foundation donor. Be afraid. Be very afraid.